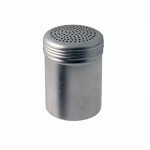 The Dredger 10oz is made from aluminium and has a screw-on top for secure shaking, with multiple holes. The holes are around 2mm wide. Sold singly.